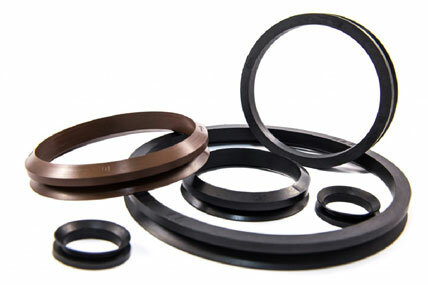 V-ring, Vrings, Vs V-rings, Va V-rings, Ve V-rings, Vl V-rings, V-seals. V-Seals are mounted on shafts and their thin, tapered lip seals against a surface counter face at right angles to the shaft. No Special demands are placed on the surface finish of the shaft seating and the V-Rings act as finger, since they have interference fit on the shaft and rotate with it. Misalignment of the shaft with respect to the counter face can be tolerated and V-Rings also provide reliable sealing if the shaft is out of round or rotate eccentrically.